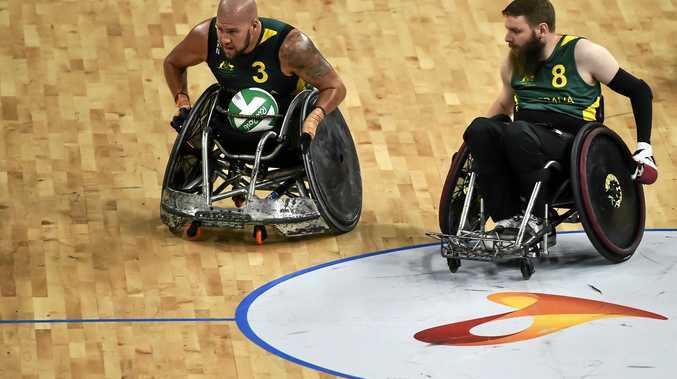 WHEELCHAIR RUGBY: Australia has rounded off the Rio Paralympics in style with gold for the Steelers. It took double overtime before the men's team defended its 2012 title from London, with a thrilling 59-58 win against the United States of America. The two teams were never more than two goals apart the whole game. Chris Bond scored an equaliser with seconds left to send the game into double overtime. The match was not without controversy. An American goal in the final seconds of the game was disallowed because the player was over the goal line when he received the ball. Ryan Scott was part of the Australian gold medal team in London and said this win was such a huge honour, again. He said the support from back home had been unbelievable. "My phone has been blowing up every time we play a game,” Scott said. Matt Lewis was at the other end of the spectrum, playing at his first Paralympics. "Once you get on to the court and you just smash the other countries, then you know you're an Australian,” he said. Lewis lost both his legs and all his fingers in 2011 when a barbecue gas cylinder exploded in his hands. "I made some poor choices about five years ago, the old me you could say,” he said. "I was mucking around with explosives and that sort of thing.